This simple shellfish starter served with crusty bread is full of flavour and very easy to prepare. This simple shellfish starter recipe from Waitrose is served with crusty bread, full of flavour and very easy to prepare. 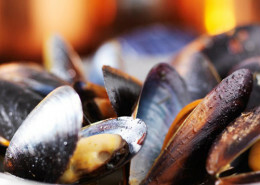 Scrub the mussels well in cold water, removing any beards from the base of the shell. 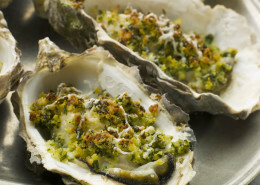 Discard those with damaged shells, or open shells that do not close when tapped sharply with a knife. Melt the butter in a large, heavy-based pan with a tight-fitting lid. Add the onion and cook for 3-4 minutes until softened. Stir in the chopped tomatoes and 150ml boiling water and bring to the boil. Tip the cleaned mussels into the pan and cover. Cook for 3-5 minutes, shaking the pan a couple of times until the shells have opened (discard any that remain closed). 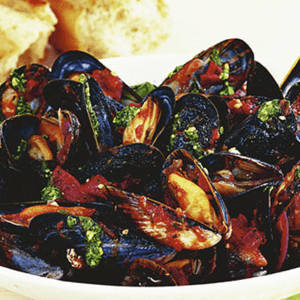 Using a slotted spoon, remove the mussels and divide between 6 bowls. Add half the tub of pesto and a sprinkling of freshly ground black pepper to the pan and bring back to the boil. Pour the sauce over the mussels then spoon over the remaining pesto straight from the tub. Serve immediately with a crusty baguette, to mop up the juices.